I know! That's exactly my reaction when I came across this recipe, too! I'd already bought brussel sprouts, I just had no idea what I was going to do with them. 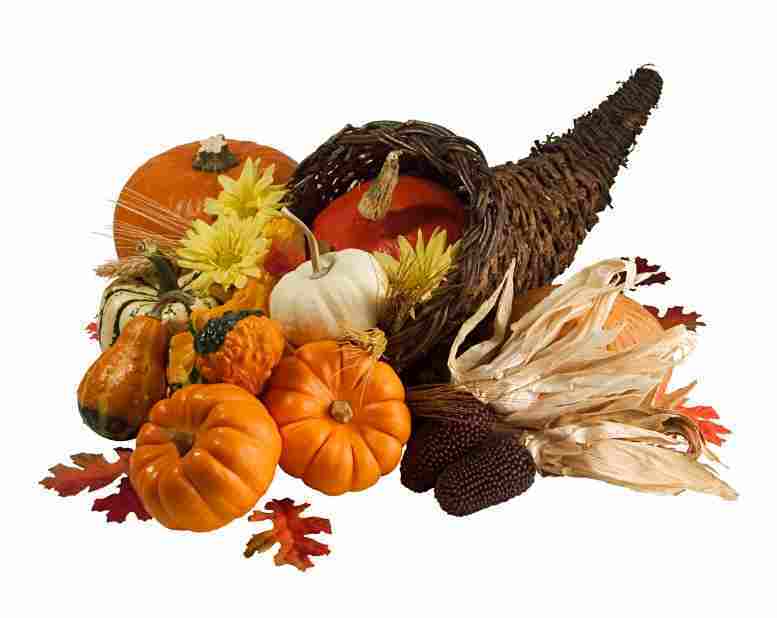 The consensus in recipes seemed to be in roasting them, but that just seemed so ho-hum. Then I ran across this little baby and it was SETTLED. Preheat oven to 400°. Discard outer leaves of brussel sprouts and give them a rinse. Trim the bottoms and halve them. In a medium bowl, toss the brussel sprout halves with olive oil, maple syrup (the real stuff, please! ), bacon, salt, and pepper. Roast for about 30 minutes, turning a few times, until the brussel sprouts are tender and caramelized and the bacon is crisp. Johnny and I ate this entire dish between the two of us because nobody else would give it a try at Thanksgiving. More for us and it was still gone within 24 hours. 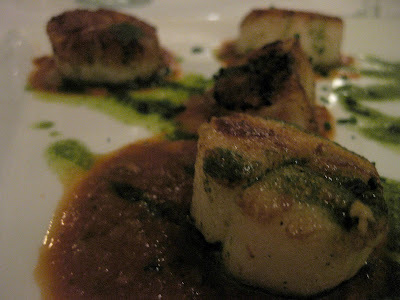 It was such a terrific medley of flavors, you just need to trust me and try it for yourself! This will forever be on my Thanksgiving and Christmas menu, it was that good! Are you already in the Christmas spirit, or do you need some help getting it jump started!? 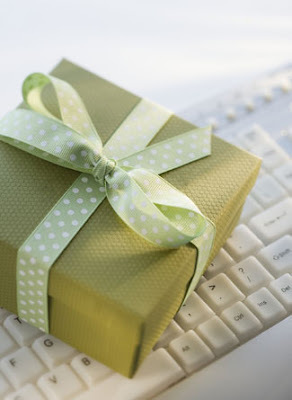 How about joining Laura's blogger gift exchange she's organizing over at Hey What's for Dinner, Mom? Hurry though, the deadline is December 1st! I already signed up, so maybe you'd get me!! 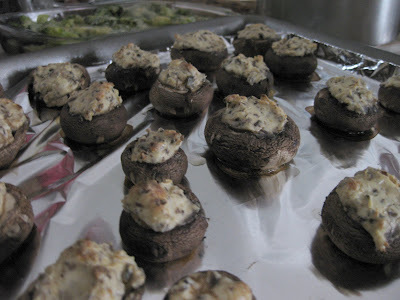 This is definitely the first mushroom recipe ever featured on my blog, and very well might be the last. 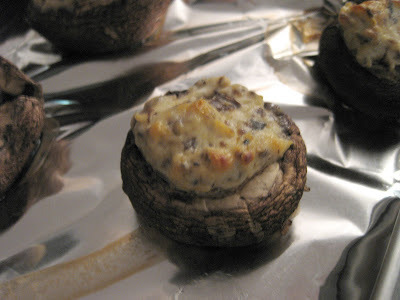 However, Johnny's sister, Di loves mushrooms and I love Di, so I made them for Thanksgiving. The recipe called for 12 mushrooms, but I called foul when I saw the amount of stuffing the recipe would make. Instead, I bought two packages of Baby Bella mushrooms, ranging in size from about an inch across, to maybe two inches across, and managed to stuff 26 with adequate filling. Preheat oven to 350°. Clean mushrooms with a damp towel and carefully break off stems, but don't discard them! Spray baking pan with cooking spray and line up mushroom caps. Chop saved stems extremely fine, discarding tough ends. Heat oil in a large skillet over medium heat. Add garlic and chopped mushroom stems to the skillet. Fry until any moisture has disappeared, taking care not to burn the garlic. (This took me about 10 minutes, stirring frequently.) Set aside to cool. Bake for 20 minutes until the mushrooms have a little bit of liquid forming under the caps. As I explained at the beginning of Friday through Monday's recap, I messed up my camera settings while out of town without my manual! I apologize, again for a) the lack of photos and b) the quality of the photos. We went to D.C. for two reasons. Reason 1 was Johnny giving demonstrations of a new software program he developed for work so users could understand the interface. Reason 2 was to receive his award! After working at his company for 10 years, Johnny received the Octave DuTemple Award, their equivelant of employee of the year (except they give it out every other year). I was really proud of him and glad that I could go on the trip to see him receive it! His boss wrote a really nice paragraph congratulating him to go in the program. It was also read as his introduction, and is inscribed on his award! All week Nicole from Just Sweet Enough and I had been trying to work out a plan to meet up! Unfortunately both of us had a lot going on that week, plus she got sick, so it never worked out, sadly! She was sweet enough to recommend Lebanese Taverna, a Zagat rated restaurant hailed as being "consistently excellent and authentic Middle Eastern fare," which we ate at Tuesday night with a small group of people who had also been hearing an excited buzz about it. Another cool thing we saw when we arrived was that they offered a gluten free menu! Allergy aware establishments always get bonus points from me! As a table, we shared baba ghannouge and hommos with fresh, hot, slightly charred flatbread that had poofed slightly as it cooked and released a warm, aromatic cloud of steam when you broke into it. Johnny had mehshi belzeit, vegetables of the day stuffed with rice, tomato, parsley and pine nuts, served over tomato sauce. I believe the veggies were zucchini, and a green pepper. Goran had mouzat, braised seasoned lamb shank over tomato sauce served with burghul pilaf. 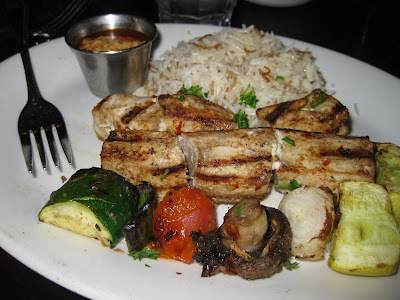 I had a fish kabob, grilled marinated cubes of fish served with vegetables and special tahini sauce made with almonds and pistachios. This was the BEST rice I've had in my entire life. Even though I was stuffed, I could not stop taking heaping forkfuls. See how it's the weird long, thin strands? Also, the sauce was to die for. I smeared a little bit on each bite of the fish and veggies. I forget the name of the place we had lunch on Wednesday! We tried one place first, but their wait was really long, so we ended up at the place next door. A coworker of Johnny's has the receipt, and I can't find it on the map! Sorry! Johnny had a turkey burger that he said was really good and moist. Goran and I both had a spinach salad with chicken. It was really flavorful with raisins, nuts, oranges, apples, and a raspberry vinaigrette. Wednesday's dinner was at Tono Sushi, which features both Japanese and Asian cuisine. We each had some of Johnny's vegetable gyoza to start. I also had miso soup before my entree came. Johnny had beef teriyaki, which had more of the delicious pickled veggies from the gyoza plate. I might have stolen some! Goran had a plate of sushi, a California roll, Mexican roll, and one other I forget. For round two, he went with an eel one and a flying fish roe one. I had shrimp and vegetable tempura, yummy yummy! Thursday we had a late breakfast at Open City Cafe. All three of us had the Open City omelet. Three eggs with hash browns, applewood smoked bacon, and aged white cheddar cheese. It came with a fruit cup, and each of us ordered juice. Johnny and Goran also ordered some of their famous coffee that came in soup sized mugs. I had a few sips of some of Johnny's, but sometimes coffee upsets my stomach and I didn't want to risk it because today was our big sightseeing day! We saw (in order) the Capitol building, the White House, Washington Monument, WWII Monument, Lincoln Memorial, Vietnam Monument Wall, Arlington Cemetery (where we saw the Changing of the Guards Ceremony at the Tomb of the Unknown Soldier), and the Jefferson Monument. Phew! We were beat and hadn't eaten anything but a granola bar since our late breakfast, that morning! We got ourselves back to the hotel, cleaned up, and ventured a little further from the hotel to Las Canteras, a Peruvian restaurant! 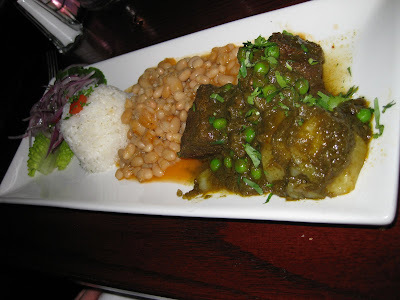 All three of us were excited to try it, because we'd never had Peruvian food before. Johnny declared it his favorite of the entire week! We arrived a little after 6, and were delighted to find an early bird special until 7 that allows you to choose an appetizer, entree, and dessert for only $24! There were a few limitations on what you could order, but it was still a killer deal, so none of us minded! We all rotated our plates around the table, trying some of each, but decided we favored the ones we'd ordered! Johnny's appetizer was papa rellenos, golden potato croquettes filled with a sauté of beef, onions, tomatoes, olives and egg. His appetizer came out a little after Goran's and mine so I forgot to take a picture because I was already eating! His entree was seco de carna, beef stew slow-cooked in a sauce of yellow pepper, paprika, onion and cilantro, served with garlic rice and beans. For dessert he chose flan, but instead of being like a custard, it was almost like a bread pudding - very interesting! Goran's appetizer was papa a la huancaina, white potatoes topped with a huancaina sauce – a blend of onion, garlic, yellow pepper, cheese and milk, it looked a lot like eggs benedict to me! His entree was lomo sel tado, tenders of prime beef, with onions and tomatoes and crispy French fries wok-fried in a wine and soy sauce, one of Peru’s most beloved dishes, according to the menu. My appetizer was ensalada de palto y queso, diced avocado, white cheese, red onions and tomatoes with olive oil and lemon dressing, the Chef's family recipe. This was delicious, but I really wished it came with chips, instead of eating it by fork! My entree was aji de gallina, shredded chicken in a sauce of bread, peanuts and yellow pepper. I was intrigued to try this after seeing Rick Bayless make several Mexican sauces using bread. For dessert both Goran and I had a Peruvian fruit mousse. I had originally wanted a rice pudding, but they were out. The waitress told me this was made with flour, so it was pretty heavy and dense. I only ate about 1/3 because there was nothing to break up the sweetness or the smooth texture. It was screaming for crunch! And that concludes our trip! The next morning, Friday, Johnny and I checked out and headed home, arriving later that night. We had some fast food along the way, so nothing wonderful. Saturday morning we picked the pets up from the boarder and I began to tackle the laundry, grocery shopping to restock the kitchen, and life slowly returned to normal... as will regular food blogging! I received my camera as a Christmas present last year from Johnny. I opened it Christmas Eve, and then early Christmas morning we jetted off to visit relatives. I've never really looked through the manual or figured out any of the settings, so I had planned to pack the manual and read it during the 11 hour drive to Washington D.C. Unfortunately, I forgot it. Which, as it turned out, was especially bad because I royally messed something up, shortly after taking our lunch pics you'll see below. I think it might have been the ISO, which affects lighting, but there were also different numbers with the letter f, which I know means an aperature change. Suffice to say, unless we were outside in perfect sunlight, my pictures were crap the entire trip. I gave up photographing most meals because it was really depressing and frustrating to see a beautiful plate on the LCD screen translate to a blurry black blob once I pushed the shutter button. So - I apologize in advance for a) the lack of photos and b) the quality of photos. We left mid morning Friday, November 13 after dropping the pets off at the boarder. For this leg of the trip I packed lunch, trying to avoid as much fast food as possible. We ate our tuna fish sandwiches, kiwi, and Edible Arrangements at a service plaza once we got hungry. The Edible Arrangements came from a complimentary coupon I received through Facebook. This 6 piece box retails for $15 and I was able to receive it, just by giving them my name, address, and email information, no doubt for marketing, but it's a small price to pay. The bananas were a bit weird, and overall the chocolate was a pretty thick coating. They're also ridiculously expensive and don't really look like bouquets in my opinion, but this little box was quite nice and would be a good hostess present. We arrived at our hotel late Friday and I was pretty mesmorized. The Omni Shoreham Hotel opened in 1930 and is the only AAA 4 Diamond hotel in Washington, D.C. It has hosted all of the Presidential Inaguration Balls since FDR and has been the site of a lot of famous entertainment venues and was in the movie Pelican Brief. Let's just say there is no way we'd ever be staying there under real circumstances, except it was a business trip paid for by Johnny's company! Our room had a king sized bed, beautiful tile bathroom, walk in closet with robes, a desk, plasma TV, and comfy reading chaise lounge. I quickly foodied the place up! Saturday Johnny and I ate lunch together at Medaterra, which surprisingly does not have a website. (It's almost 2010, people!!) Described as Mediterranean-American cuisine with an Egyptian flare, Johnny had a grilled chicken wrap with a tahini dressing and I had a mahi mahi sandwich. Saturday's dinner we ate with Johnny's work best friend Goran, who you'll be seeing a lot of in recaps, because we ate most of our meals together. Dinner was at a charming French restaurant, Petits Plats, just a short walk from the hotel, as were most of the restaurants we ate at all week. Johnny had a steak with garlic mashed potatoes and vegetables, Goran had veal cheeks that he said were the best cheeks he had ever eaten, and I had scallops (Johnny photoshopped the pic so you could actually see it!). Friday, Saturday, and Sunday was pretty swarmed by school groups. I saw a bunch of various sports teams, newspaper staff, and other groups. It was a madhouse to even get down the sidewalk, and most restaurants were accomodating groups of 30+, making our waits long. Knowing how quick Medaterra was the previous day, we decided to eat there again with Goran for Sunday's lunch. Johnny got a chicken pizza, Goran got a falafel sandwich, and I got a lamb pizza. We ate outside, so this picture is actually a nice one! The pizza was on this freshly grilled flat bread with a little bit of char. It had a spicy sauce, marinated lamb, and goat cheese. It was maybe 10" across, but I couldn't finish it all. That night we had dinner at my cousin Paula's house, who lives nearby. My dad was visiting on his way back from NY, so we were able to see him, too. My mom was flying into D.C. from a recent trip that night, but we missed her by a few hours! My dad grilled some steak and chicken, and whipped up some homemade garlic mashed potatoes. Paula made a delicious zucchini and yellow squash dish. She sliced them thin with a mandolin, layered them in a casserole dish, sprinkled with herbs, layered with mozzarella cheese, dabbed a little butter and baked until everything was tender. We were so busy talking I didn't get any pics of the food, but here's us! When we went outside to say bye, my dad showed us this massive cheese he got from a specialty store! It was the size of a basketball!! Monday's lunch was at Murphy's Irish Pub. Johnny had a burger, but declared it the best burger he'd ever eaten, so I forgave him. 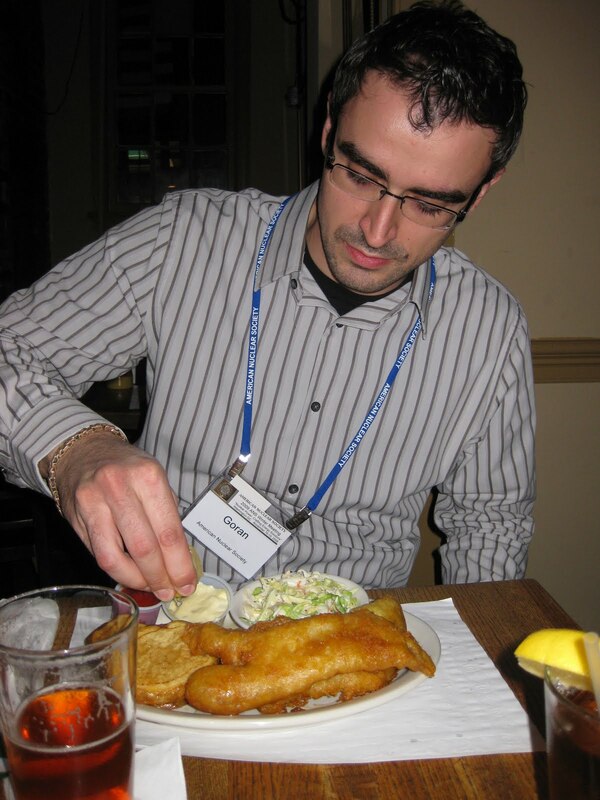 Goran had fish and chips, and I had my first official reuben, but I wasn't that impressed, it was pretty dry. Goran and I had authentic cottage fries with our meals, which I found exciting because I've seen them so many times on Food TV, but never had them before! Dinner that night was at Afghan Grill, which was one of my favorite meals of the entire trip. I'd never had Afghan food before, but dove right in, expecting to be surprised. Goran and I split the Afghan salad for an appetizer, which was amazing. If I could have, I would have licked the plate. Johnny's main dish was Lamb Sabzi Chalao, a stewed spinach dish with lamb and this rice that was different than any rice I'd ever seen. The grains were thin, long slivers. Goran had the lamb kabob, and I tried a dish called Mantoo, steamed beef dumplings topped with garlic yogurt and vegetable sauce. I washed everything down with an iced tea, but it was a Turkish tea! Almost spicy, but very crisp and light - like nothing I've ever had! For dessert we split Firnee, a custard with crushed pistachios on top. The dessert I originally ordered was sold out, so they gave us a free Baklava, too. The firnee, as silly as it seems, tasted EXACTLY like suntan lotion, but at the same time it was delicious! The baklava was a depart from the Mediterranean versions I've always had, sticky and drowned with honey. This was a light pastry, minus the honey. We enjoyed both desserts thoroughly, and polished them off, despite being stuffed to the brim. Come back in a few days for Tuesday through Thursday's recap!